Triangle won by 164 runs. Booth 3 pts, Triangle 12 pts. Bowling: R Laycock 10 1 62 1, O Collinge 12 2 46 0, N Horsfall 10 0 71 1, P Thomas 6 0 46 2, R Worsnop 4 0 46 0, S Butterworth 3 0 35 0. Bowling: K Whippey 8 1 42 1, T Fryer 7 1 37 2, M Uttley 6 3 38 4, D Turner 6 1 18 3. Jer Lane won by 9 runs. Jer Lane 11 pts, Queensbury 5 pts. Bowling: M Johnson 10 1 46 1, G Singh 20 3 67 5, A Ali 13 0 74 2. Bowling: N Khan 5 1 28 0, N Chowdrey 14 0 63 4, S Collins 18 1 78 3, J Lister 8 2 25 2. Copley won by 4 wkts. Southowram 2 pts, Copley 12 pts. Bowling: I Hartley 14 6 37 2, R Thorpe 11 3 33 2, C Goulden 9 4 20 4, M Baldwin 6 1 25 2. Bowling: T Belfield 10 1 35 1, S Griffiths 18 6 46 3, S Moody 6 2 17 0, A Froste 3 1 13 0, A Measey 5 2 15 2. Thornton won by 4 runs. Thornton 11 pts, Blackley 3 pts. Bowling: C White 9 1 53 0, D Peel (Jnr) 12 3 54 2, R Jennison 6 0 42 0, J O’Connell 9 1 45 0, T Baxter 1 0 21 0. Bowling: J Hutchinson 14 3 69 5, R Parr 16 1 68 2, J Blencowe 3 0 18 0, G Soames 8 1 35 2, M Clayton 4 0 24 0. Sowerby Bridge won by 90 runs. Sowerby Bridge 12 pts, Mytholmroyd 3 pts. Bowling: J Earle 19 3 69 3, A Azam 14 5 37 2, J Cowens 9 1 57 2, Z Mahmood 3 0 22 0. Bowling: J Dixon 9 0 58 3, S Mellor 13 8 11 7, A Richardson 5 0 26 0. SBCI 12 pts, Warley 4 pts. Bowling: R Hanson 14 2 48 3, S Bragg 7 1 9 1, T Wood 13 2 35 2, D Sykes 7 1 27 2. Low Moor won by 58 runs. Low Moor 12 pts, Northowram HT 4 pts. Bowling: S Gardner 11 3 31 0, M Gardner 12 2 41 1, H Talbot 9 2 28 4, J Fearnley 3 0 26 1, A Stocks 7 0 46 1, D Cole 3 0 19 0. Bowling: S Waheed 12 61 4, A Croasdell 7 0 32 0, R Dowling 7 0 19 2, B Williamson 12 0 24 3. Bowling: M Schofield 12 3 34 0, M Hoyle 6 2 20 1, C Punda 16 3 34 4, G Grogan 11 0 60 2. Bowling: J Baines 6 0 41 1, R Beaumont 12 3 62 4, L Broadbent 10 3 29 2, J Firth 3 0 13 2. Bowling: J Bower 9 0 45 2, E Pollard 5 0 24 0, J Ackroyd 15 1 75 3, M Benson 8 2 33 3, T Halliwell 4 2 33 0, S Sutcliffe 3 0 27 1. Bowling: S Mawer 4 0 17 1, J Jheeta 11 1 27 3, L Dyson 8 0 39 5. Bridgeholme won by 8 wkts. Bridgeholme 12 pts, Ludd Foot 0 pts. Bowling: J Stott 5 2 19 1, T Hosker 7 2 47 1, A Roy 2 1 17 0. Clayton won by 2 wkts, Outlane 4 pts, Clayton 12 pts. Bowling: M Roe 11 4 20 0, P Gelder 16 3 54 1, J Selby 11 1 39 6, T Shackleton 1 0 23 0, A Windle 5 1 21 3. Bowling: A Blagborough 7 1 49 1, S Ainley 7 1 23 1, A Shaukatt 11 2 49 4, J Wrigley 6 0 29 0, C Westwood 5 1 16 2. 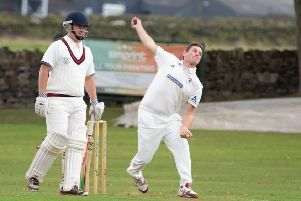 Greetland won by 74 runs. Greetland 12 pts, Dengholme Clough 5 pts. Bowling: S Mahmood 11 3 28 1, W Ali 4 2 15 0, I Akram 6 0 38 1, A Hanif 10 0 57 1, M Aslam 12 0 66 6. Bowling: S Malik 12 0 47 0, C Soulsby 14 1 57 4, M Sohail 6 0 14 6, M Waqas 3 0 21 0. Shelf won by 69 runs. Old Town 4 pts, Shelf 12 pts. Bowling: B Barker 5 0 35 1, A Asghar 18 0 61 3, J Khan 17 4 74 5, H Butterworth 3 0 42 0, T Jones 1 0 12 0. Bowling: R Ramsden 14 2 66 4, N Armitage 4 0 42 1, T Lamb 5 1 44 1, D Wilkins 4 0 10 3. Upper Hopton won by 15 runs. Crocs 4 pts, Upper Hopton 12 pts. Bowling: R Dixon 17 4 43 1, J Linsel 12 2 38 4, J Hemblys 12 1 36 5, M Jowett 1 0 16 0. Bowling: J Stanger 19 7 35 7, R Ellis 8 2 46 0, L Harrington 11 1 41 1. Bowling: M Jordan 9 2 41 2, P Fenton 11 0 77 2, A Beesley 5 0 28 0, D Anderson 6 0 48 0, R Hassall 4 0 27 1, W Chaudhry 3 0 21 0, R Gamble 2 0 21 0, A Syed 5 0 38 1. Bowling: C Welch 14 2 67 1, G Rankin 8 2 21 4, W Rankin 6 0 29 0, J Rogers 5 1 22 0, S Welch 4 1 23 0, D Robinson 8 1 34 1.